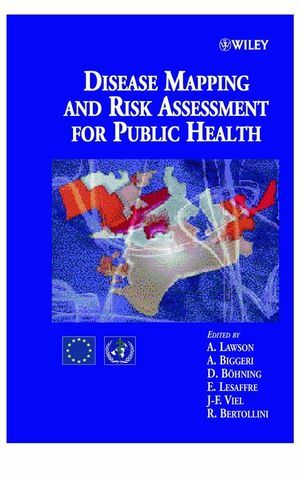 Representative of the most pertinent issues within disease surveillance and mapping, this book will provide an accessible overview for statisticians and epidemiologists. Disease Mapping and Its Uses. Disease Mapping with Hidden Structures Using Mixture Models. Inference for Extremes in Disease Mapping. Edge Effects in Disease Mapping. Empirical Studies of Cluster DetectionDifferent Cluster Tests in Application to German Cancer Maps. Introduction to Spatial Models in Ecological Analysis. Multilevel Modelling of Area-Based Health Data. RISK ASSESSMENT FOR PUTATIVE SOURCES OF HAZARD. A Review of Modelling Approaches in Health Risk Assessment around Putative Sources. Lung Cancer Near Point Emission Sources. PUBLIC HEALTH APPLICATIONS AND CASE STUDIES. Environmental Epidemiology, Public Health Advocacy and Policy. The Character and the Public Health Implications of Ecological Analyses. Estimating the Presence and the Degree of Heterogeneity of Disease Rates. Ecological Regression with Errors in Covariates: An Application. Lung Cancer Mortality in Women in Germany 1995: A Case Study in Disease Mapping.